You could never really expect any blog posts from me that concerns the entertainment world, except when they are about movies. I just don't know how to pull writing one off. I guess you could say that I am not really into these kind of stuff. I don't even watch TV programs of this nature. Perhaps if I have TFC? Hmmm.... Don't get me wrong, I have nothing against the entertainment business. I even wish I were more up-to-date because that's what most people talk about in a conversation: the latest trends in fashion, Hollywood biggies, hits that made it to the charts. I am glad there is Beng's Entertainment Spree. It is my source of the latest entertainment news both from the Philippines and the international scene. But this blog is not just about celebrities and their lifestyles. It is also about Beng's idea of entertainment and fun: movies with the family, Filipino humor, meeting local celebrities, even politics. It is through this blog that I learned the story about the latest on Kris Aquino's marriage, that Rica Peralejo just got married, the there is a new Shrek movie that will soon hit the big screen. I know these stuff are not unknown to you... so I must be living in a hermit hole. LOL! The blog is published on Blogger and has a three-column template. The background color, which is a shade of pale violet red matches the header. There are ads that can be found so that one can hint that this blog is monetized. I find the blog entry title font color to be very attractive and very readable. The text color though could use another color than black because I sometimes find the text difficult to read. Perhaps a complimentary color for pale violet red or white text color will do the trick? Just a suggestion for Ms. Beng.... Despite this, I still enjoy visiting this site. What I have missed I can always look up in the archives. 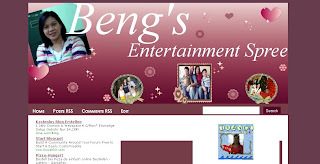 If you are looking for entertaining stuff, why not visit Beng's Entertainment Spree? You'll surely learn a thing or two! I just did... I now know something about the Phillipine showbiz scene that hubby doesn't know about. Hehe!